Although it is at the height of the company briefing session for the 2019 new graduate recruitment (we call it Challenger Recruitment here at AMATA) our’s was kind of different from the rest. Rather than “hiring,” it’s closer to “training.” We implemented a system where we bring an alumnus from our company to present for our recruitment briefings at their previous school. 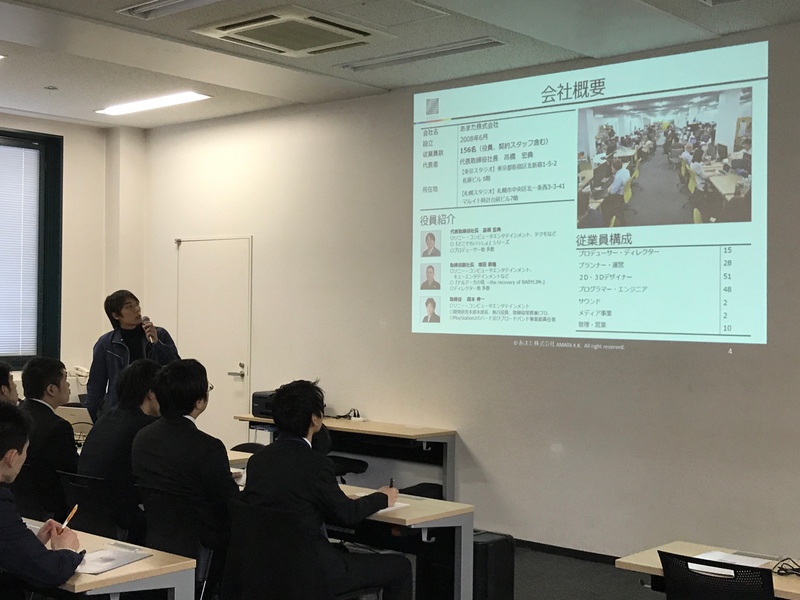 Even during the ‘intense week of school visits’ 2 weeks ago (this article), we brought in a graduate of Kyoto Seika University, who has successfully carried out this important role. By the way, the man in the picture (our graduate) is Mr. p from (this article). After that, this week we visited Kobe Institute of Computing. Mr. S from our company graduated two years ago from this school. This time, it was his turn to present. Despite being from overseas, he presented the Powerpoint slides in fluent Japanese, added his own comments here and there, and thus admirably accomplished the task.